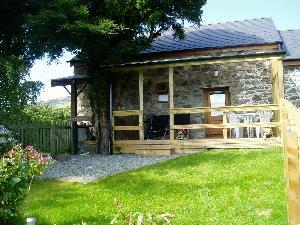 Belle Vue Cottage01691 860384work Self-cateringThe cottage is situated between the lovely villages of Penybontfawr and Llanrhaeadr-Ym-Mochnant near Powys-Shropshire border. Attached to the owner's property, it comprises an unusual open plan living and kitchen area to full roof height with exposed timbers and a wooden staircase to the twin-bedded mezzanine floor. On the ground floor, there is also a double bedroom and shower room. To the rear, the sheltered patio and bbq area lead to the private garden with breathtaking views over the valley. The kitchen is fitted with sink, cooker, microwave and fridge with freezer compartment. The living/dining area has a flat screen TV and DVD player and a selection of indoor games. Both villages are a short distance from the cottage with good local shops and pubs serving food. There are many places of interest to visit in the immediate area, including lakes Vrynwy and Bala, Rhaeadr waterfall the interesting market towns of Oswestry and Welshpool and historic town of Shrewsbury. 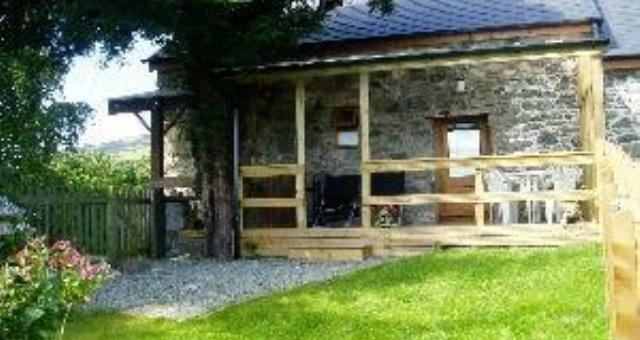 The cottage is situated between the lovely villages of Penybontfawr and Llanrhaeadr-Ym-Mochnant near Powys-Shropshire border. The location is perfect for a rural break and ideal for walking, cycling, fishing, bird-watching or just relaxing and enjoying the beautiful countryside. Outdoor and indoor games available, free books and DVD lending library, private enclosed rear garden with decked patio area and BBQ Children welcome from any age. From the A483 from Chester towards Welshpool, turn right at Llynclys at the White Lion Pub onto A495 signposted to Llansantffraid and Llanrhaeadr. In a few miles, when the A483 to Llansantffraid turns to the left, keep straight on the road which now becomes B4396 and continue through the villages of Pen-y-bont Llanerch Emrys, Llangedwyn and finally Llanrhaedr-Ym-Mochnant. From the village, continue up the hill signposted to Penybontfawr and Lake Vrynwy and Belle Vue is just over a mile up the road on the right. Both front and rear entrances have a threshold, but once in the property, all facilities apart from the Twin-Bedded Mezzanine room are on the ground floor.